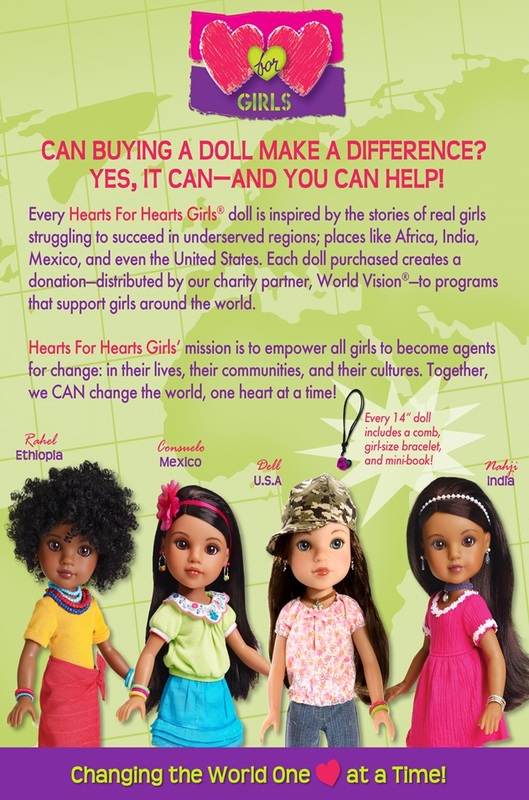 Support empowering girls to be Agents of Change in their communities with their $1.00 donation to World Vision International with every doll purchased! Heart for Hearts Girls are a range of 36cm/14" dolls designed to encourage doll loving girls to build friendships and respect cultures other than their own. The dolls have been beautifully designed to have a contemporary feel with clothing based on traditional costume from their culture. The detail on each doll is incredible and it's no surprise that the dolls have won lots of awards since their launch in 2010. Each doll arrives with a beautiful outfit, a mini story book giving details of their life in their own country, a comb and a girl sized bracelet. To accomplish this, we produced beautiful, culturally diverse dolls that were reasonably priced. Their clothing was inspired by traditional fashions and patterns, but modified to appeal to a contemporary audience. We took great care in the details, creating multiple sculpts for their heads and designing unique jewelry for each doll. Because our brand mission was an emotionally-driven one—to "change the world, one heart at a time—we also recognized the importance of content. Our dolls needed to be characters, and they needed stories to help girls understand where they came from and what their lives were like. Only by adding this dimension would our young consumers find a way to connect and be engaged beyond the usual doll play. So we created diaries for each doll, derived from multiple stories of real girls living in the same regions. We packaged a mini-book version in each doll box. And we included an inspirational bracelet for the girl to wear. Finally, we needed a charitable partner—because we wanted to "make a difference" by donating a portion of each doll's purchase price to charity. We chose World Vision, a well-respected and global humanitarian organization that could use those donations to help children in need everywhere. In late 2010, the doll line was launched in retail and online channels. The response was gratifying. · The brand made Dr. Toy's 2010 100 Best Products list, along with being recognized by Dr. Toy (aka, Stevanne Auerbach, Ph.D., who has reviewed children's products for 25 years) as one of the 10 Best Socially Responsible Products for 2010. · Our dolls won a DOTY (Doll of the Year Award) for both 2010 and 2011, an award sponsored by Doll Reader magazine and created to celebrate dolls with exceptional design and manufacture. · We were asked to participate in the 2010 UN International Year of Youth celebration at the United National headquarters in New York City. · Our website won a coveted W3 award, given to outstanding Websites, Web Marketing, Web Video, and Mobile Apps created by some of the best interactive agencies, designers, and creators worldwide. Best of all, we captured the enthusiasm and support of moms and girls everywhere. Moms who were looking for a brand that went beyond the so-called "pink aisle," that metaphorical (and literal) place in retail stores that caters to girl products focused on fashion, glamour, pets, and playing mommy. These moms recognized and applauded our focus on real-world girls and their challenges and on the altruistic aspect that allowed their daughters to help girls in other cultures. We believe that Hearts For Hearts Girls was ahead of its time—and that its mission is more relevant than ever today. Never has there been a greater need for girls to come together in friendship and respect, to learn about and understand cultural and ethnic diversity, and to have an alternate perspective offered to them—one that goes beyond pessimism, conflict, and suspicion to the heart of real girls in this world. We're thrilled to have MPA Sales expand this brand into new markets and introduce it to new girls. They are enthusiastic partners who believe wholly in Hearts For Hearts Girls and are committed to its success. We are continuing our relationship with World Vision. 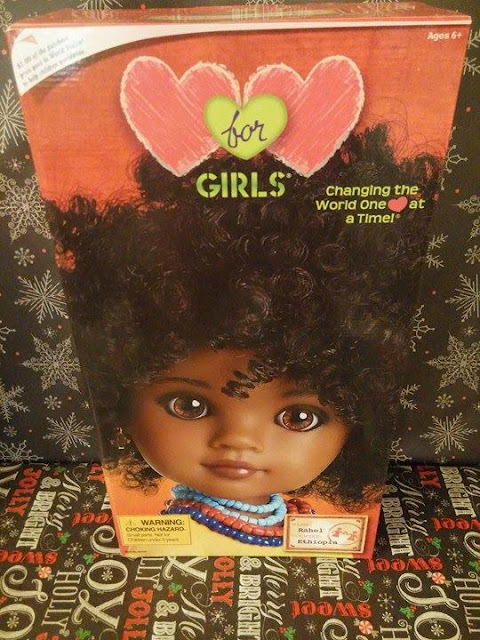 For every doll sold, we will donate $1 to their programs. Some people have wondered if $1 can really do any good, but it all adds up. Hearts For Hearts Girls has donated $350,000 to World Vision so far. With this fresh launch of the brand, we hope to help even more. Because that's our mission, to try and "change the world, one heart at a time." I was excited to be a part of the relaunching of these 4 beautiful Hearts For Hearts Girls during this holiday season! I love that girls can have dolls who look like them and can have dolls and learn about other cultures while being Agents of Change in their communities with their $1 donation to World Vision Internation by purchasing a doll. 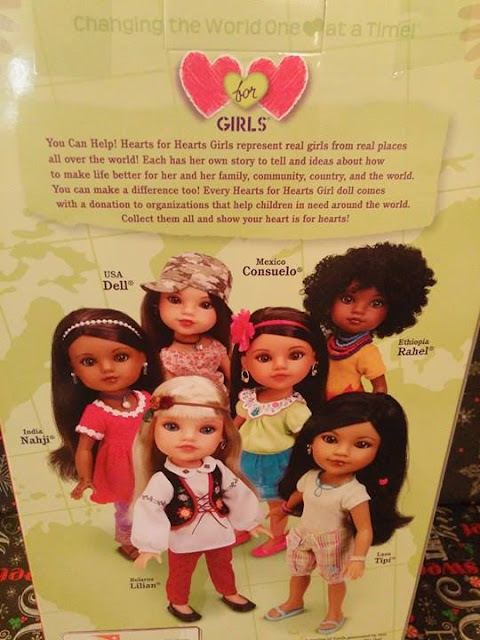 I like that these dolls were inspired by real girls and their stories as well as promoting and building friendships and respect for other cultures. I think it is the perfect gift for any occasion, especially during this holiday season when we are celebrating and giving to others. 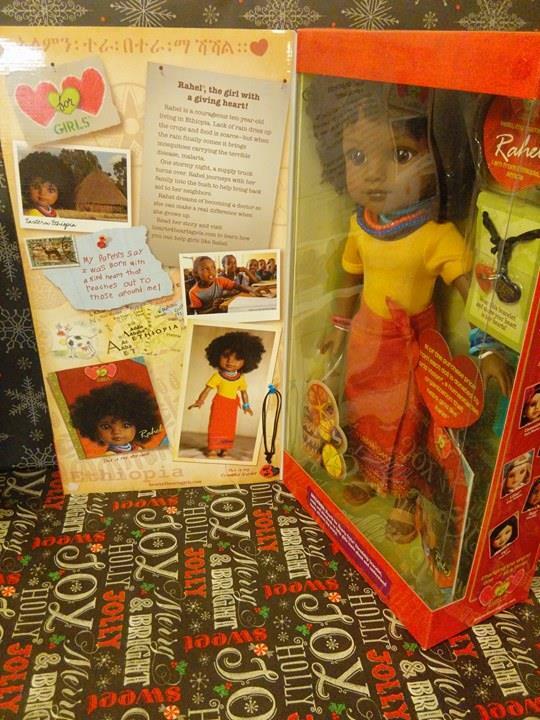 I chose Rahel (Ethiopia) because she looks like our 4 year old and I know this will make her very happy to open on Christmas morning. 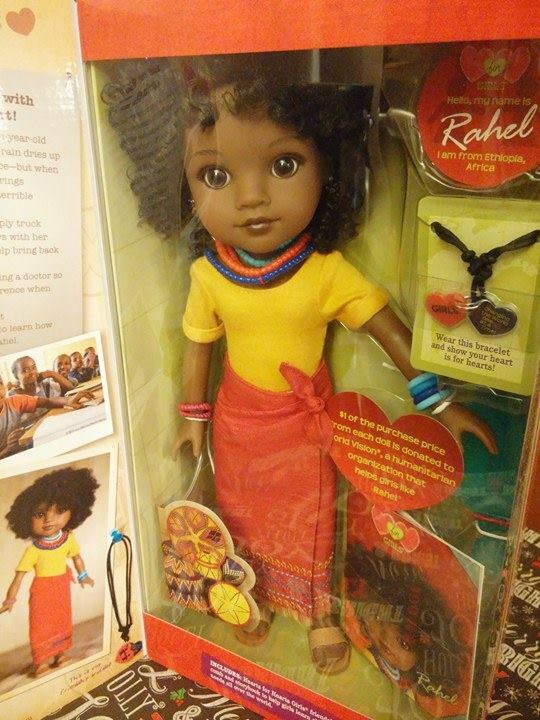 I know she will especially enjoy the friendship bracelet from Rahel. The dolls are beautifully packaged and well made with a message of love.